A portion of John Phifer's will from the State Archives of North Carolina's collection of North Carolina Secretary of State Wills. The State Archives of North Carolina recently announced the creation of a new digital collection, North Carolina Secretary of State Wills. The digital collection contains wills from 1663 to 1789. These are loose original wills probated in the colonial North Carolina province. After 1760 most original wills were kept by the clerk in the county in which they were probated, though there are some wills after 1760 in the collection. You can browse the collection or narrow your search using the Mitchell Will Index, which can be accessed in the Manuscript and Archives Reference System (MARS) catalog. The original wills are no longer accessible to the public for conservation concerns. Due to the age of some of the wills, the ink may be difficult to read. The wills are arranged alphabetically by surname of decedent. One notable person in the collection is Patriot and statesman, Lt. Col. John Phifer, who lived in what would later become Cabarrus County. 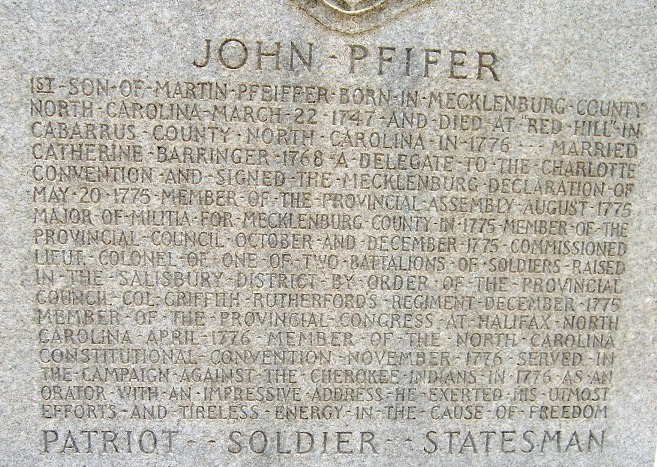 John was born 25 Mar 1747, the son of distinguished Patriot and pioneer, Maj. Martin Phifer Sr., and his wife, Anna Margaretha (Margaret) Blackwelder Phifer. John is attributed with being one of the signers of the Mecklenburg Declaration of Independence. The document is asserted to be the first declaration of independence made in the thirteen colonies during the American Revolution, which began with the armed conflicts at Lexington and Concord, Massachusetts in April 1775. The so-called "Meck Dec" preceded the U. S. Declaration of Independence by one year, however, its existence is disputed by some historians. The narrative maintains that John, a leading member of the local militia, was summoned with 27 others to attend a convention in Charlotte where they signed the radical document on 20 May 1775. John Phifer's will, written in 1774, details land and property, including named slaves, left to his children Paul, Margaret, Ann Elizabeth, and wife Catherine Barringer Phifer. John expresses concern about the spiritual and academic education of the children, especially son Paul, and he lists his father Martin Phifer and father-in-law, Paul Barringer, as executors of the will. McGill Ave./Poplar Tent Rd. in Concord. John died at Red Hill in late 1776. 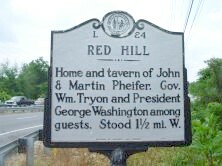 Red Hill was one of Martin Phifer's plantations and the location of a tavern where John and his brother, Martin Phifer Jr. both lived at different times in their lives. Red Hill famously hosted Martin Jr.'s friend, President George Washington on 29 May 1791, as he passed through the area on a southern tour. Included with the will is a document from the January 1777 session of the Mecklenburg County Court stating that John Phifer had died and so ordered an inventory of the estate and payment of any debts. A granite monument memorializes the contributions of John and other Phifer family members at Concord's Oakwood Cemetery. The Phifer Family Cemetery, located at the end of Lucky Drive in Concord, was established in 1767 and is a preservation project of the Lt. Col. John Phifer Chapter of the Sons of the American Revolution. The Secretary of State Wills collection of the State Archives of North Carolina can be found at: http://digital.ncdcr.gov/cdm/home/collections/secretary-of-state-wills. John Phifer's will is: http://digital.ncdcr.gov/cdm/compoundobject/collection/p16062coll41/id/8730/rec/1. Monument inscription in remembrance of John Phifer, Oakwood Cemetery, Concord. Photo by Terrance McManaway, www.findagrave.com. State Archives of North Carolina, Secretary of State Wills collection. North Carolina Highway Historical Marker Program, Red Hill. www.ncpedia.org, State Library of North Carolina, Martin Phifer. Horton, Clarence E. Jr. and Kathryn L. Bridges, eds., Piedmont Neighbors: Historical Sketches of Cabarrus, Stanly and Southern Rowan Counties from the Pages of Progress Magazine, p314-315.